The anemone plots at Mussel Shoals consist primarily of the colonial anemone, Anthopleura elegantissima rather than the solitary anemone Anthopleura sola (note that these were considered a single species prior to the past several years and they are not distinguished in our sampling methods). Within the anemone plots, the mean cover of Anthopleura began close to 100% in 1994, declined gradually to under 60% by 1998, then hovered around 80% for several years through 2004. After that, two cycles of decline and recovery occurred through 2009, each with anemone cover returning to about 80%. Since then, the plots have experienced increasing seasonal variability with the mean anemone cover occilating between 60-90%. Much of the early variability was the result of a single plot which, since its inception, had alternated back and forth between anemone dominated and mussel dominated cover. The more recent variability is the result of seasonal sand burial episodes which affect four of the five plots to varying degrees. These anemones are quite resistant to these periods of sand burial. Despite being obscured by sand during data collection, their actual cover hasn’t changed that much throughout these burial episodes. In fact, one of these plots has had a consistent anemone clone separation line in the same position for at least 15 years. The barnacle plots at this site consist of a mixture of Chthamalus dalli/fissus (note that species were not distinguished until 2001) and Balanus glandula with the former dominating some plots and a more even mixture in others. These plots are located on riprap boulders in an area subjected to recurring scour by sand and cobbles. This is reflected in the data which show barnacle cover (and, inversely, bare rock), fluctuating extensively and repeatedly throughout the years. Barnacle cover has been reduced to near zero twice during the monitoring period (spring of 1996 and spring of 2007) with less significant declines to around 40% occurring four other times. In each case, high recruitment has allowed these plots to rebound within a single sampling season with cover usually reaching levels of 80 to 90%. One plot disappeared completely in the late 1990's as the boulder it was housed on became dislodged and overturned. A replacement plot was installed, but shortly thereafter, a subsequent storm flipped the boulder over again allowing the sampling of that missing plot to resume. 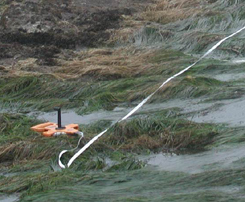 While the orientation of that plot has changed somewhat, making it more susceptible to encroachment by mussels, anemones and turf algae, it continues to be sampled along with its replacement plot. Motile invertebrate counts at this site began seasonally in the fall of 2000 and were changed to annual sampling in 2004. Within the barnacle plots, littorines and limpets are both highly abundant with the former varying in the neighborhood of 500 individuals per plot and the latter around 50 per plot. Like barnacles, limpets were scoured to nearly zero in the spring of 2006. Limpets were less common in the last two years of sampling. The mussel plots at this site have been fairly stable throughout the years with mussel cover in the 80 to 90% range most of that time. A decline occurred in 2005 and 2006 reducing mussel cover to about 60%. After that, mussel cover gradually increased to near 100% in 2009 where it remained until 2012 (note that there is a data gap for Fall, 2009). Since then, mussels have declined with cover reaching the 50% range in fall 2014. These plots are mostly comprised of small and tightly packed mussels, and are located on the shoreward side of a large rock ridge which presumably makes them more resistant to scour or breakout. Scour does occur as sand and cobbles build up at the base of the mussel reef and move back and forth with the wave surge. This causes mussel loss at the lowest portions of some plots. The data from the motile invertebrate sampling show that snails (Nucella spp. and Tegula funebralis) were more common in the mussel plots in the first few years of sampling. Shore crabs (Pachygrapsus crassipes) were also a bit higher then as well. In recent years, the abundance of these motiles, along with littorines, has been low (less than ten individuals per plot). Limpets, on the other hand, started out low in the early years, but with increases to over 50 individuals per plot in the later years. This may be partly due to methodological changes: prior to 2006, only limpets on rock were included in the counts whereas limpets occurring on mussel shells were added after that. Littorine sampling in these plots ceased in 2014. Rock ("Above Barnacles") plots were added to this site in the fall of 2008 to document any upward spread of intertidal species as a result of global climate change or other factors. These plots are expected to remain dominated by bare substrates unless barnacles or other species begin to encroach upon them. 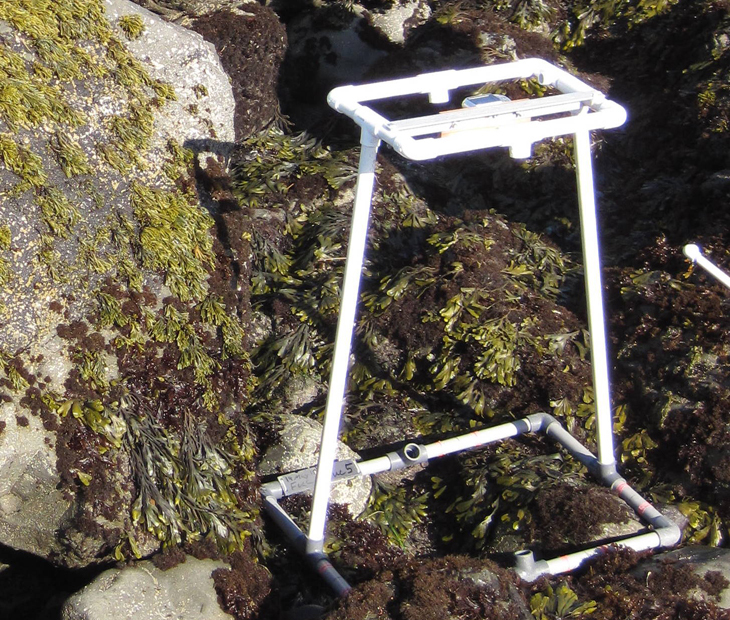 Barnacles have been observed within these plots since their inception, though their percent cover has remained low or undetected in data collection. One plot is a bit lower than the others and has yielded up to 5% barnacle cover. Littorines have been common in most of these plots since their inception. The mean cover of Surfgrass (Phyllospadix spp.) at this site started out near 80% in 1994-1995 but then underwent a precipitous decline to around 40% where it remained for several years between 1998-2005. It declined further to almost 20% in 2009, but has rebounded since then and is now around 75% as of fall 2014. Egregia, red algae (primarily Chondracanthus sp., Gastroclonium sp. and filamentous species) and bare rock increased during periods of Phyllospadix decline. The reasons for these population fluctuations are not known. Throughout this time, Phyllospadix has also varied seasonally with higher cover typically found in the fall and lower cover in the spring. Sea star (Pisaster ochraceus) abundance has been variable at this site over the years vacillating between about 70-80 stars during some periods and closer to 20 stars during others. More recently, however, seastars have become much more abundant with numbers exceeding 200 individuals in fall of 2011 and well over 100 stars still being present until fall 2013 when the seastar wasting disease began affecting coastal sites in southern California The disease was not confirmed at this site until spring 2014 when multiple sick, drooping and “melting” stars were observed during our sampling in late February. Well over 50 stars were counted during that sampling event, but when the site was revisited a month later in late March, only a few stars remained. Fortunately, while some sites remained devoid of stars long after the disease swept through, this site seemed to rebound quickly with about 20 stars counted in fall 2014, all of which were healthy in appearance. 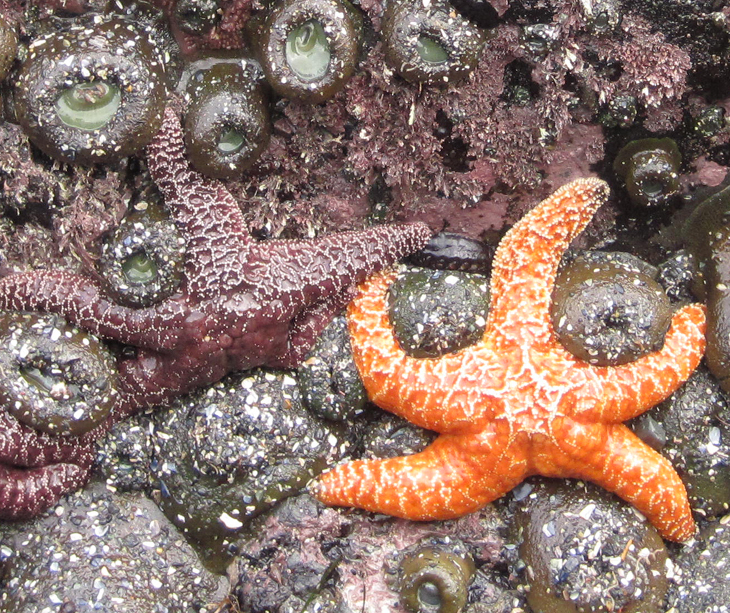 Seastar sizes have been measured since the fall of 2000. Their sizes tend to be relatively large at this site compared to others with relatively low recruitment of small (<50mm) individuals during most years. This suggested that, despite extensive sand barriers offshore of the sites, the seastar population at the site was maintained through migration in and out of the site rather than through recruitment. But then in the fall of 2010, a large recruitment pulse of small individuals was observed and those growing stars were responsible for the greater abundance of stars observed at this site in recent years. Likewise, recruitment of young stars is largely responsible for the recovery of stars we have seen since the disease struck this site.